The Caretaker likes the sound of her name as it brings to her mind gentle strokes, caresses and safety. As a young child the Caretaker wrote short poems of women and owls. She soon taught herself the art of systematizing and sorted the poems into rectangular blue-coloured envelopes following a complex order. At an early age the Caretaker started carrying a bunch of keys mainly for grandparents’ cellar doors, jewellery boxes and canned tunafish. She still clings to the keys, in love with their clattering sound and ringing noise. 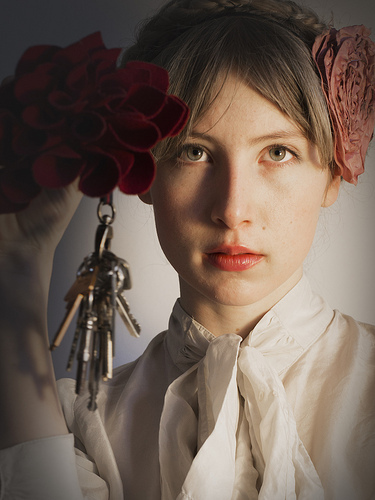 It is her many keys and her obsession with systematizing which secured her the job as caretaker at Sisters’ Academy. Friends and acquaintances often tell the Caretaker that she looks like a sweet little girl, but she talks in a slow dark voice to gain respect. To protect her fair cheeks and delicate chin from sun and rain she wears an old straw hat decorated with a white bow. When working, the Caretaker insists on wearing embroidered gloves to relieve her hands. She likes to stand cross-legged with one hand under her chin, the other holding the keys in a firm grip. Although the Caretaker may seem timid, she walks in a fast and determined way. When not working at the school, the Caretaker resides in the rainy North, where she takes long walks, sleeps and writes more poems of women and owls, longing for someone hairy to bite her ears of.